On February 12, 1820, the Ohio government authorized the creation of Wood County. Residents named the county in honor of a hero of the War of 1812. Wood County was originally part of territory set aside for Ohio’s Native Americans by the Treaty of Greenville. During the War of 1812, the county was the site of Fort Meigs, an important American fort that protected Ohio from a British invasion from Canada. Today, the Ohio History Connection operates a museum at Fort Meigs. 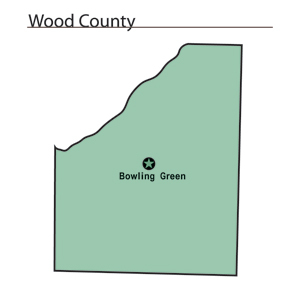 Wood County is located in the northwestern part of Ohio. The county seat is Bowling Green, which is the largest community in the county, with a population of 29,636 people in 2000. Bowling Green is also the site of Bowling Green State University. Two percent of the county’s 617 square miles are deemed to be urban. The county averages 196 people living in each square mile. Between 1990 and 2000, the county experienced a 6.9 percent increase in population. This growth primarily occurred due to residents of Toledo, Ohio, in neighboring Lucas County, seeking to escape the busyness of this large city. In 2000, the county’s residents numbered 121,065 people. Most of Wood County’s residents find employment in agricultural positions, with seventy-seven percent of the county’s acreage under cultivation. Wood County farmers rank first in Ohio in wheat production, second in tomatoes, third in soybeans, and fourth in corn. Manufacturing, retail, and service positions finish second, third, and fourth respectively. Many residents also work in Toledo. In 1999, the county’s per capita income was 26,737 dollars, with 7.1 percent of the county’s residents living below the poverty level.